When would you like to stay at YHA Perranporth? YHA Perranporth is all about location! 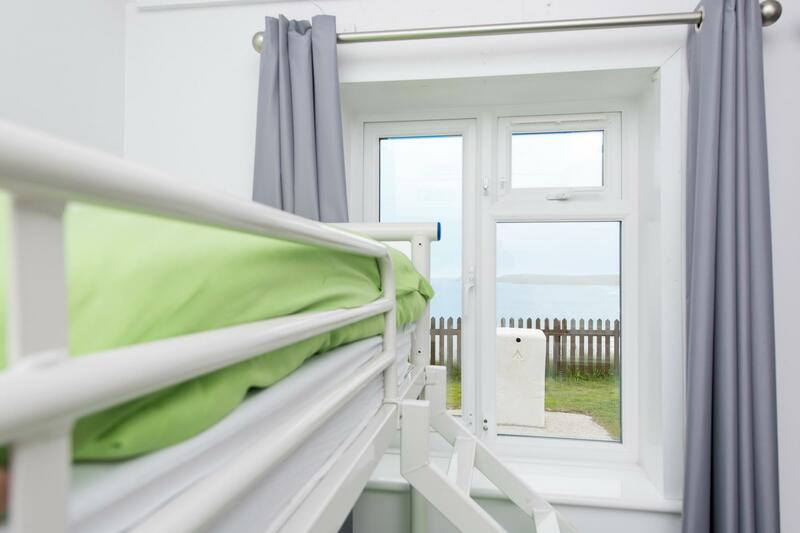 This small and friendly Cornish hostel is situated in a stunning cliff-top position, with spectacular views of the Atlantic Ocean and two and a half miles of sandy beach. So if surfing, body boarding, kayaking or coasteering are your thing, or if you love strolling along the beach or the South West Coast Path, YHA Perranporth offers the perfect getaway. There is a small 3 bedded room (with a bunk and a single bed), a two bedded room by the dining room (with a bunk bed), a three bedded ensuite room (with a single over double bunk bed, and a kitchenette), and two larger eight bedded rooms (with four bunk beds). There are three toilets and three showers located a short distance away. Due to the nature of the building all of the rooms are fairly small. 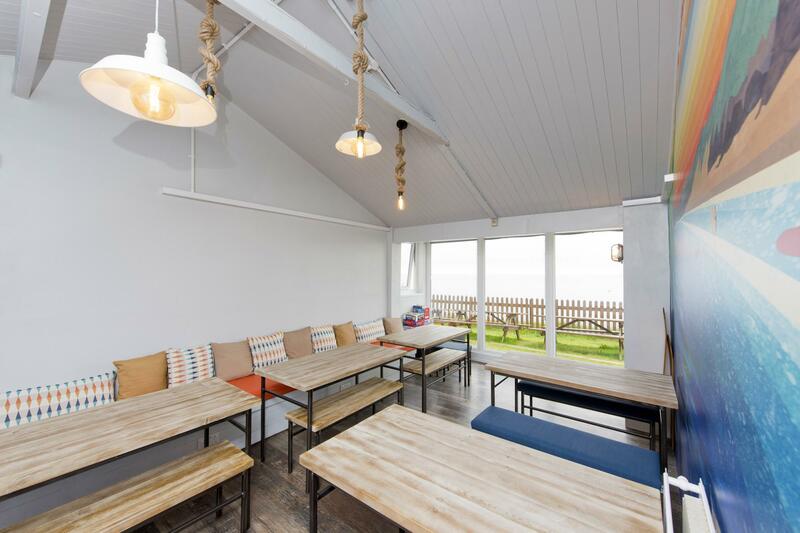 The open plan dining room provides a perfect place to socialise, overlooking spectacular coastal views with it’s new floor to ceiling window. The hostel is self-catering only and has a freshly fitted, well-equipped kitchen. We have two cookers, eight hobs, a microwave, two kettles, a toaster, one larder fridge, a small freezer and plenty of pots, pans and cutlery. There is a good selection of local shops in town, including plenty of pubs, restaurants, takeaways and cafes to choose from. Whether you want fish and chips, Chinese, Indian or Italian we've got it all nearby. Good pubs near us include Seiners, The Watering Hole and The Smuggler's Den (just 5 minutes' walk away). If you want to get closer to nature, YHA Perranporth has a slightly sloping fenced lawn in front of the main building. There is space for one small, robust two person tent. It’s in a very exposed cliff-top location, 180ft above the Atlantic Ocean. So when it’s windy and the sea’s rough it can be a rather extreme camping pitch, not for the faint hearted! Camping is only bookable by calling the hostel directly 01872 573812. If there’s a local low pressure we also recommend giving us a call the day before to check the weather and swell forecast. Standard booking Terms & Conditions apply. Please bring all your own camping equipment. Campers are welcome to use the hostels facilities. Try a four mile section of the stunning walk from Perranporth to St Agnes, discovering the industrial and geological heritage of the area. 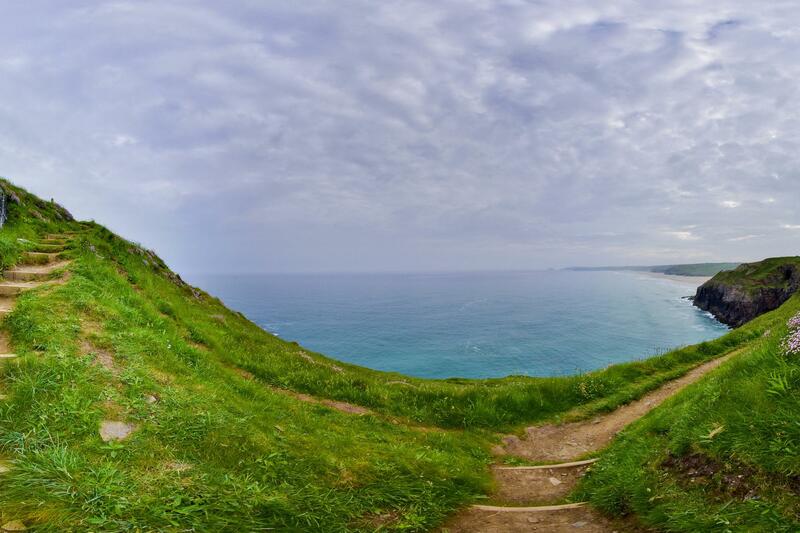 The Cornish Cycle Way passes nearby, revealing historic towns and fishing villages, distinctive landscapes and friendly pubs as well as a colourful tradition of arts and crafts and festivals. Cligger Head between Perranporth and St Agnes offers pleasant climbs at the lower grades up to 120ft. (Climbs 26, granite, tidal altitude, NW). Take to the waves! The hostel is just ten minutes from Perranporth beach, one of the finest surfing and body boarding locations in Cornwall. Open every day? : YHA Perranporth is open every day from March to October. From November until the end of February, the hostel is only open for group bookings and YHA Exclusive Hire. Parking: Pay and Display parking is available in the nearby field car park. Make YHA Perranporth your home for a few days by booking the whole place to yourself! Visit our YHA Exclusive Hire website for more details. Open for bookings from the Autumn half term to the Easter holidays. A.E.S. Perranporth was built in the early 1950’s as a top secret Admiralty Experimental Station and research laboratory studying and developing shore-based submarine detection. The old radar base can still be found in the back garden. It opened as a Youth Hostel 1982, and is still used today for coastal research by both Plymouth and Oregonstate University. Perranporth, known for its amazing beach and great summer holidays has a long history stretching behind it. It is believed that St. Piran, Cornwall’s patron saint, arrived along the coast in the 7th century, where he founded his first church and monastery - which can still be viewed when walking the dunes near Perranporth. In many years to follow the town of Perranporth popped up, becoming a small tin mining village in the 19th century. Perranporth’s beaches started to draw a number of holiday makers at the turn of the century, becoming more accessible by the Great Western Railway line that ran through Perranporth. During WWII Perranporth grew in importance as its airfield became a base for RAF Spitfire squadrons. Today you can take scenic flights from the airfield or do a tandem skydive with incredible views over the bay. The huge sandy beach and decent waves still draw crowds like they’ve always done! Phil loves to surf and spend time with his family, and enjoys everything related to the sea, coast and great outdoors. In his spare time you’ll find him exploring rock pools, gliding the waves or walking the coastal footpath. On his days off he likes to traverse Cornwall with the family, and is always happy to share his knowledge of magical places and the best wave-catching spots! Hello YHA Crew! I’m Cat and I’ve just moved down to Perranporth! I’ve moved down for the surf and coastal energy and have landed in the perfect spot to combine it with working alongside a well respected organisation I can put my dedication into. Hi, I am Linda. I live locally and am often seen walking past the hostel with my dogs. I am, however, new to working for YHA so am hoping for a great new experience! Hi, I’m Joel, and I’ve recently moved here to Cornwall in hope of a change of pace. Although I was drawn here by the walking and the watersports, the YHA provided me with a great way to meet fantastic people and explore the local area, something equally as enjoyable as the surf! The redevelopment of YHA Perranporth has been part funded by the European Agricultural Fund for Rural Development.